Tim Burton’s Latest FIlm ‘Big Eyes’ Releases First Trailer!!! 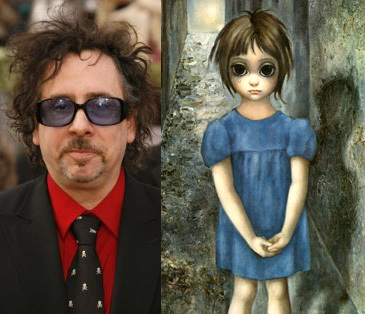 When Tim Burton makes a new movie, it gets attention. Be it good, bad or ugly, people talk about it. The newest film to add to the cannon of Burton films is ‘Big Eyes‘. His latest live action film since 2012’s ‘Dark Shadows‘. A drama centered on the awakening of the painter Margaret Keane, her extravagant success in the 1950’s and the following legal problems she had with her husband. Why did she have legal problems with her husband, you ask? He claimed credit for her paintings in the 1960’s. Talk about a maladjusted marriage! Makes Ike and Tina Turner look like a model of marriage perfection. We get our first look at the trailer released by The Weinstein Company. The film stars Amy Adams as Margaret Keane and Christoph Waltz as the plagiarism claiming husband, Walter. All acting along-side Danny Huston (‘American Horror Story‘), Krysten Ritter (‘Breaking Bad‘), Jason Schwartzman (‘The Darjeeling Limited‘) and Terence Stamp (‘Smallville‘). I’ve got the first clip released of the film below that will open on Christmas Day. 4K UHD Review: ‘Justice League’! This entry was posted on Friday, September 19th, 2014 at 2:03 pm	and is filed under Art, Film, News. You can follow any responses to this entry through the RSS 2.0 feed. You can skip to the end and leave a response. Pinging is currently not allowed. « Film Review: ‘ABC’s of Death 2’!! Why don't you just hand 'em blindfolds, Captain? All we can do here is die.